More things to share about the new website. In addition to all the wonderful formatting and organization of Symbala World, there are new Symbala products, too. Zazzle is the name of a website which offers artists the resources to publish, promote and showcase their art and art products in many forms. I now have TWO Symbala Stores! My regular Symbala Store on this website offers original, commissioned Symbalas, Personal Symbala Dialogues with either Arlene Arnold or Peggy Smith and Symbala art prints in 2 sizes, large and small. My new Zazzle Store offers your favorite Symbalas on regular Greeting Cards, Magnets, Coffee Mugs and more new products in development. I am so grateful to my friend, Deneen, who discovered and shared Zazzle with me. Thanks to Zazzle’s expertise and ability to produce high quality art products, Symbala World is greatly expanded. The main products I’m offering through my Zazzle store are Greeting Cards. They’re produced on glossy card stock and the colors are clear and vibrant, perfectly suited to Symbalas. They’re 5 x 7″ and come with an envelope. Not only are they eye-popping, but I’m selling them at a low price of $4.50 each (quantity discounts are also available). I haven’t developed as many magnets as cards, but keep checking back because I’m still working on it. The magnets are 3″ rounds, brilliant and perfectly suited to this circular art form. They’re decorating and raising vibrations on my own refrigerator and office filing cabinet. Have fun with these for only $4.50 each as well. 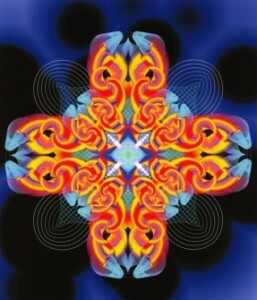 There are Zazzle Flash Panels showing Symbala products all throughout the Symbala Galleries. They will take you to the new store where you can browse and buy. Zazzle takes your orders, produces them and ships them directly to you. If you have any confusion finding your way in the store, remember to look for the ‘Lahrinda’s. Those links will always take you back to my main storefront on Zazzle. This website still has its Store (greatly spiffed up, too) where you can purchase original commissioned Symbalas, Symbala Water Imprint sets and the regular 8 1/2 x 11″ prints. The 5 x 7″ art prints are also still available there for as long as my stocks last. Their price has been reduced to clear. When you visit my Zazzle store, you will see categories of cards that have little or no cards in them. As I said, I’m still working on them. If you go looking for any in particular and don’t find them, please let me know and I’ll make sure it’s added quickly and let you know. Everyone I’ve showed the cards and magnets to so far are high in praise and impressed by the quality, as am I, or they wouldn’t be offered to you. Go there and explore – you’ll love the way you can mouseover and click on them to see amazing close-up detail. New Home for Me, Too! Recently, my life has been full of change and transformations. I have been challenged to live my principles time and again. Each time I do that, scary as it feels, the outcome always feels expanding and in resonance with my essential self. 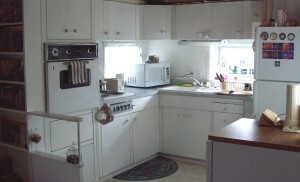 I was living in a happy and comfortable environment for over 5 years, not ideal, but very cozy and affordable. My landlady, Bettie, became a good friend and supporter of my art over the years. 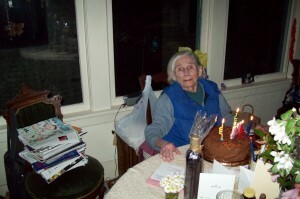 She turned 94 this spring and her health took a turn for the worse not too long after her birthday. When she didn’t spring back after a few months, her daughter decided it was time to install a fulltime caregiver in my top floor sanctuary and I was given my notice on August 3rd. Here was a challenge of the first order! Bettie’s friendship was irreplaceable, but I had to find a new space for myself, my business and my very large movie collection. 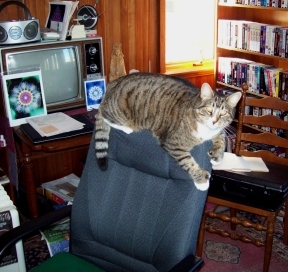 I also loved and had to let go of the neighborhood and my feline friend, Pretty Feet (Bettie’s cat). Here’s a picture of her in what used to be a favorite spot – the back of my computer chair! I was in a grieving process of letting go of so many things, near and dear. But I also realized I had been given a gift, the gift of change which always makes way for new energies and experiences. August became a blur of memories, packing and searching. However, by asking for what I wanted and working with the Law of Attraction a novel idea came to me – it was finally time to stop renting! 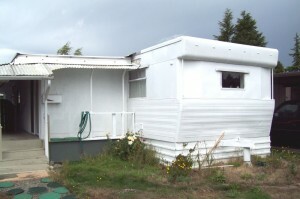 I narrowed my search to affordable mobile homes and within 2 or 3 days had found just what I was looking for. I knew it was my right place because everything just flowed easily once I made the decision. My friend, Madeline Gerwick, the ‘Good Timing Guide’ lady, was a help in so many ways, not least in her suggestions for good days and times for closings and signings. Friends volunteered for the moving part and I didn’t even have to rent a truck to move to my new home about 10 miles south in SeaTac (south Seattle area near the airport, but amazingly quiet). It all got done in one day and even before my moving deadline! It’s older and not fancy, but it’s all mine and I love it! 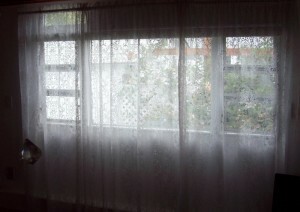 Here are some pictures of my ‘White Palace’ (thanks, Teresa). 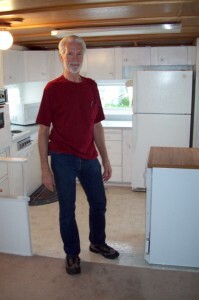 This is my friend, Michael, in the kitchen before I moved and here’s the kitchen after I moved in. This is the living room window group that looks over a honeysuckle bush frequented by hummingbirds. When I saw that I really knew I was in my right place. There were many perks for me personally about my new place. 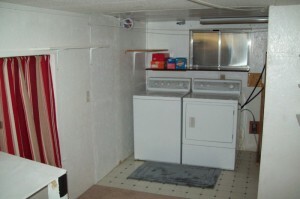 The joys of my own roomy laundry room, a regular kitchen with a full size refrigerator, stove top and oven, lots of built-in book shelves, plenty of extra storage, a covered carport and mail delivered right to my door! Ah, it’s the little things that add up to a happy home. 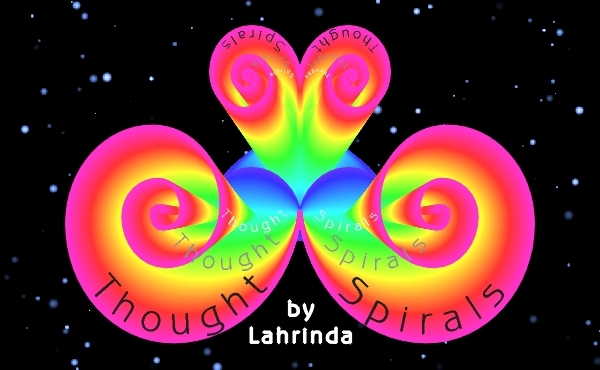 Posted by Lahrinda in Thought Spirals from Lahrinda,What's New	Comments Off on New Home for Me, Too! We have so many reasons to be happy! I believe in HAPPINESS and rather than listening to news and other fear-based conduits I focus my attention on manifesting more personal joy which always spreads. Did you know that it has now been proven scientifically that HAPPINESS IS CONTAGIOUS? One of the ways I have to spread this joy is by creating Symbalas! Now more than ever is the time to remember that we are the center of our manifested world and we fill it with the focus of our attention, our beliefs and our imagination. And it is all right NOW, not in the future or the past. Take a break from the news. Put your attention on a Symbala and relax, shift and reconnect with All That Is. For a better understanding of what’s going on with Symbalas, take a look at the Symbala Manual. Allan Harris did a splendid job of researching, interviewing, organizing and writing this manual. I contributed, but he did the lion’s share. The manual is intended as a reference: where did Symbalas come from and some inspiration and suggestions for their use. This manual can be printed out for your use and/or sent to a friend. It’s very versatile! This time period is showing many of us quite clearly that the old ways/paradigms aren’t working any more – at least, not in a satisfying, joyful manner. Many of us feel as if we’re straddling at least two worlds and the feeling is distinctly unsettling. Seeing through different lenses is critical. Our vocabulary sets the stage for building new paradigms. To release concepts that don’t fit our intentions, let go of words that don’t resonate. I have gone through the whole website making such changes to reflect my own ‘attituning’. When necessary, create new words to carry your intentions. It’s great fun! Also, one of the main purposes of a Symbala is to be a focal point lens for intention. Supported by the universal structure of the Golden Proportion, contemplation of a Symbala allows you to attune to new harmonies. 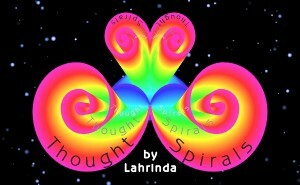 Posted by Lahrinda in Symbala Stuff,Thought Spirals from Lahrinda	Comments Off on HAPPINESS IS CONTAGIOUS!